How do you transform an organization whose analytics team services 400 marketing stakeholders and thousands more in sales worldwide? Hear from PTC, a $6BN+ global technology provider, and its story of organizational transformation creating real performance visibility, and driving revenue growth that made sales fall in love with marketing. 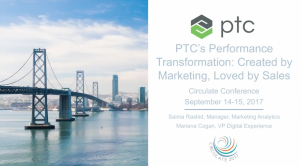 Presentation by Mariana Cogan, VP Digital Experience and Saima Rashid, Manager, Marketing Analytics, PTC at Circulate 2017. Created by Marketing, Loved by Sales.